Using the trading view Advanced Chart software will certainly give you an edge. Don’t forget to trade after doing your analysis! The chart is extremely intuitive but here is a quick tutorial on using it. (if you do not see the left hand panel click on the little arrow on the left hand side in the middle of the graph). Everything on the left panel is for drawing. The tools allow you to draw symbols, lines, shapes, measure distances and zoom in on a certain area. They also include a huge variety of calculated lines and arcs such as Gann and Fibonacci. These tabs allow you to change the candle or tick size from 1 minute to 1 month per box or tick. This provides an incredibly large list of indicators and tools to select from. This button will allow you to add a symbol on the chart to compare too. These buttons will take a picture of the graph so you can send it to someone. 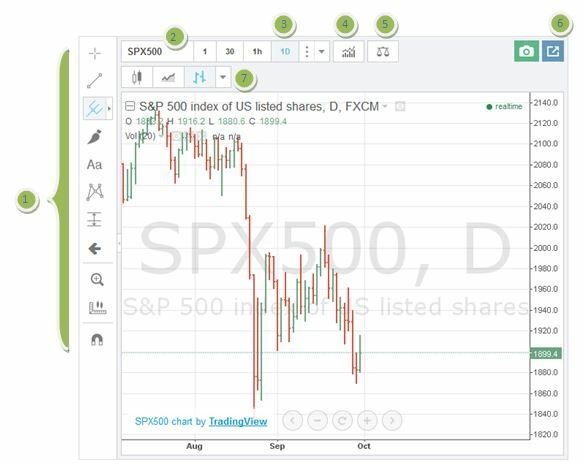 The button to the right allows you to open a new window of the Trading View Advanced chart. ← The Blue Chip Challenge Is Over!